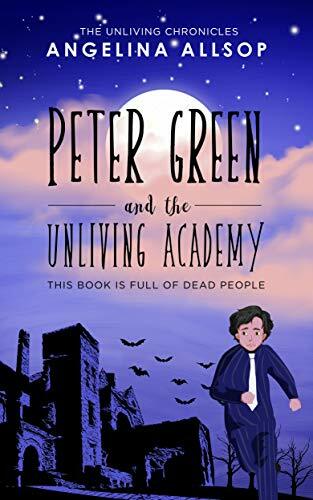 Peter Green and the Unliving Academy is Angelina Allsop’s first published book, initially offered under the title The Dead Orphanage, and it is also the first in her Young Adult (YA), AfterLife fantasy series. The book is filled with Allsop’s unique view of “AfterLife,” as distinguished from “Life.” There are plenty of otherworldly creatures such as werewolves, witches, vampires, poltergeists, skeletons, zombies, and ghosts, as well as a full assortment of “unliving” humans not possessing any special powers when compared to their peers. Of course, all of the unliving can do a few things unheard of in the living world. Published in November 2018, in this first installment, Allsop has created a memorable new world, and Peter Green is trying to find his way. Pete is 14-years-old, or was at the time of his entrance into this new world. He’s a little confused and lost because he has no memories of anything from his past other than his name and his age. He doesn’t know how he got there or why he’s dressed rather outlandishly in striped pajamas and a silk tie. Something else is also bothering him. He’s concerned that somebody needs his help, but he doesn’t know who or where they are. Meanwhile, before Pete can address his primary concern, he needs to figure out how to fit in where he is. The story begins in what seems to be a transit station of some kind. After nicely describing the scene where Pete initially lands, Allsop shows how the world appears to work, detailing the sights, sounds, and activities surrounding Pete. After navigating through a rather intense bureaucracy (yup, even in AfterLife one cannot get away from forms and lines it seems), the bulk of the action takes place at the Unliving Academy. This academy is a prestigious, yet frightening, school where certain underage arrivals with no existing connections in AfterLife are sent to learn about their new world. Not all unconnected young arrivals get to attend the academy, but the story doesn’t really address where the other unconnected youth are sent in any detail. What is clear is that there is a mystique surrounding the academy that puts outsiders a bit on edge. In addition to getting an introduction to AfterLife, the academy is also a place for its students to gain the skills necessary to determine their AfterLife career needs, whatever those may be. Although the academy is essentially a pre-college level boarding school, the subjects are a little different from the ones these kids were studying prior to their arrival in AfterLife. In addition to some intriguing new subjects, Pete encounters some elite, extracurricular associations and training that go far beyond nominal AfterLife schooling. Allsop develops interesting and realistic characters that will engage readers and tug at their emotions. Some of the characters are extremely likable, some are not, while others are downright terrifying. Pete and his schoolmates behave much like any other group of teenagers, except for various undead abilities that are slowly revealed throughout the story. Their interactions and humor are age appropriate for the characters and the intended reading audience. Their teachers are also quite memorable and realistic when viewed from an adolescent’s point of view even though many of them are mystical creatures unique to Allsop’s unliving world. The Unliving Academy exists in Purgatory, and Pete quickly learns that there are many different realms within AfterLife, Purgatory being only the first to which he is exposed. He must study and gain experience before he can move on to more permanent placement. This isn’t the Purgatory readers may know from Roman Catholic doctrine. It is not a place for punishment or penance. Instead, its purpose is to provide a place of learning and adjusting. The story is a nice combination of mystery and adventure, keeping the reader turning pages to find out what happens next. There are just a few minor shortcomings to the book itself, mostly related to its editing. While the story is well thought out, a few situations or reactions happen a tad too frequently. One example is that Pete squeaks and jumps a lot in reaction to most situations he encounters. Also, the prose contains many errors that should have been caught during the editing process. The typos occasionally leap out, and wrong words can take the reader completely out of the story in few places. Otherwise, the book is an entertaining read that leaves the reader wanting more. The story at hand resolves rather nicely, and it also sets up the next installment of Allsop’s YA, AfterLife fantasy series. While this particular series is aimed at middle grade or young adult readers, it is also a pleasant read for adults who enjoy whimsical fantasies with engaging, school-age protagonists.